Cooking for someone else this summer got me thinking about the school year dinner menu. At the beginning of last month, I helped out a young woman at our church who had recently had some surgery that left her on “light duty” for 4-6 weeks. She’s got a new baby and several other children, one of whom is a toddler himself. You can laugh. A mom…on light duty. I know what you’re thinking. That’s what I thought too, so I sent her a message to see if I could help her out at all by making a few meals that she could just reheat. She said absolutely. I had asked her because the next day I had some time to myself, just a few hours in the afternoon where I could run to the store and pick some things up and prep her a few meals. It wouldn’t take much time and at the moment, I was able-bodied with older kids who’d be away for part of the day, so I was able to help out. So often throughout my parenting life, I’ve had these moments of “Why didn’t I think of that sooner? ?” and this was one of those types of moments. Now clearly, I know how to cook ahead, I know how to freeze meals, but oftentimes I don’t do it soon enough. Like in the summer. I’m so carefree in the summer as compared to the school year, that the last thing I’m thinking about is dinner for the first month of school. This had me thinking though. I was going to try to do better. Each year I find that I’m just a little more organized than the last year. Each year, I get better. As a friend joked with me recently, by the time my oldest goes to college, I’ll be all set, totally prepared and organized. Oftentimes, I find myself making breakfast and dinner at the same time. 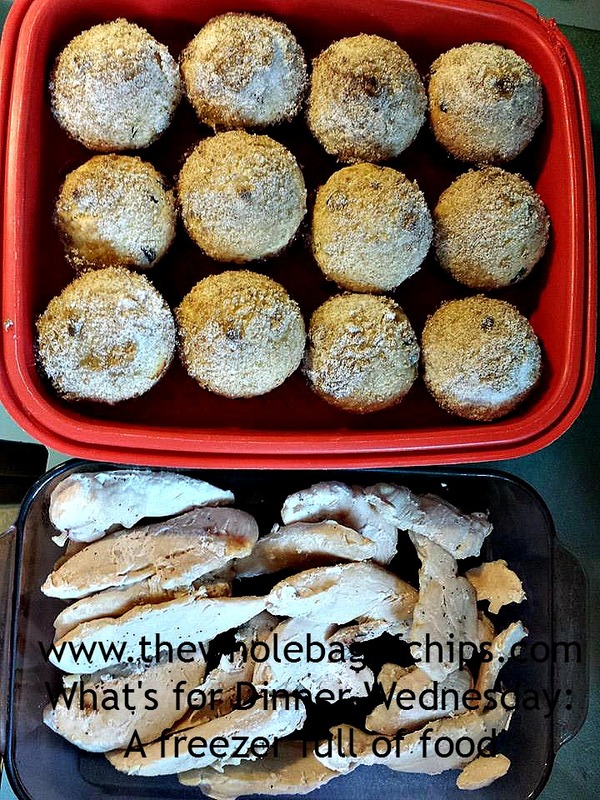 Here I’ve got muffins for breakfast, and cooked chicken to freeze ahead for a future lunchbox salad or a dinner. A few weeks later, I sat with one of my daughters who loves to menu-plan and we made two lists: the first list was a list of make ahead meals we wanted to make and the second list was a shopping list of all the things I’d need to pick up in order to make anything ahead; things that would be above and beyond my normal two weeks of meals shopping list. On our list for the grocery store included things like multiple pounds of ground turkey, multiple bags of chicken tenderloins, multiple boxes of pasta and a jar of sauce (in this case I was not using our homemade sauce). As the summer progressed I kept these things in mind, and as I planned out my meals, I tried to think of things I could make double of, eating one that night and freezing one for another night. One night that wasn’t too hot to bake, I cooked up enough ingredients for two chicken pot pies. I used the recipe linked here and used chicken instead of turkey. I also only use a top crust on my pies, so one box of two refrigerated crusts will equal two pot pie meals. One Sunday, my husband made a double batch of American Chopped Suey and we ate a batch and froze a batch. Now we had two frozen meals. The weekend before school began, we did a shopping and picked up a family pack of ground turkey which contained three pounds. 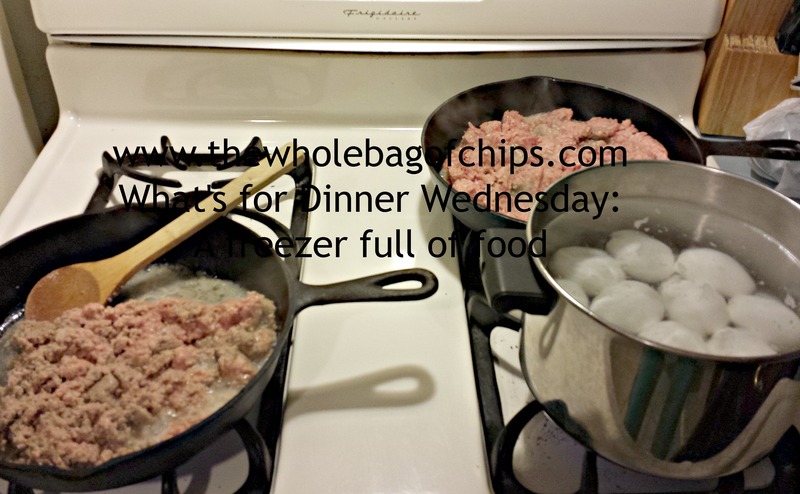 I split it into one pound and two pounds and cooked them up in two separate skillets, shown above at the left, where I was also hard-boiling eggs for the fridge for the first week of school breakfasts and lunches. Into my one pound of ground turkey, I added a packet of Taco Seasoning. I had a packet on hand, but you can also make your own, which I’ve done in the past. I split that pound of taco meat into two half pounds and froze them. I now had enough taco meat for a taco meal and lunches of taco salads, or two taco meals or two sets of lunches with taco salads. Either way, I was set for a little bit with taco meat. All I needed to do now was thaw it and use it. Into my second skillet containing two pounds of ground turkey, I put two cans of creamed corn for a Shepherd’s Pie. We found that we need two pounds for one pie, given the size of our family. It also provides us leftovers for another time. I put those into the freezer with the taco meat. The night before school, I made Chocolate Chip Muffins for the first day of school breakfast. After they baked, since the oven was already on, I cooked up an entire two-pound bag of chicken tenderloins. 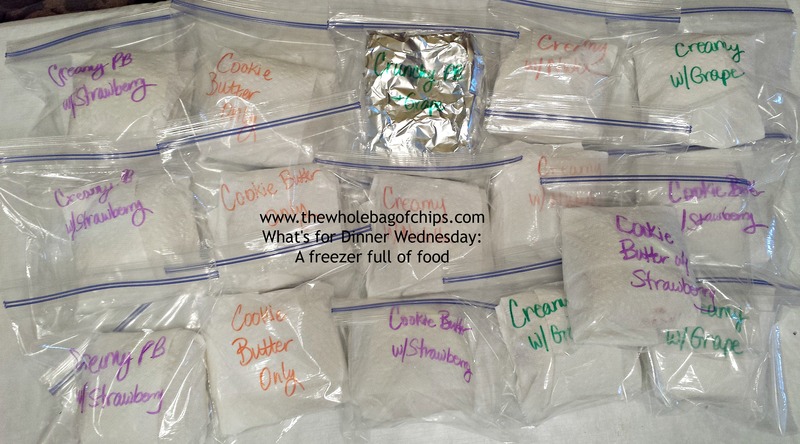 These I froze for future dinners, salads, lunches ( chicken caesar salad is a popular choice). I was making real progress. I think this excited me the most of all: two loaves of bread made into sandwiches of the kids’ choosing, and frozen for lunches. And finally, the thing I’m probably most proud of that I’d been wanting to do: my make ahead sandwiches for the freezer. I can’t take any credit for this idea. A friend who I get a lot of great ideas from in my menu-planning had the idea herself. 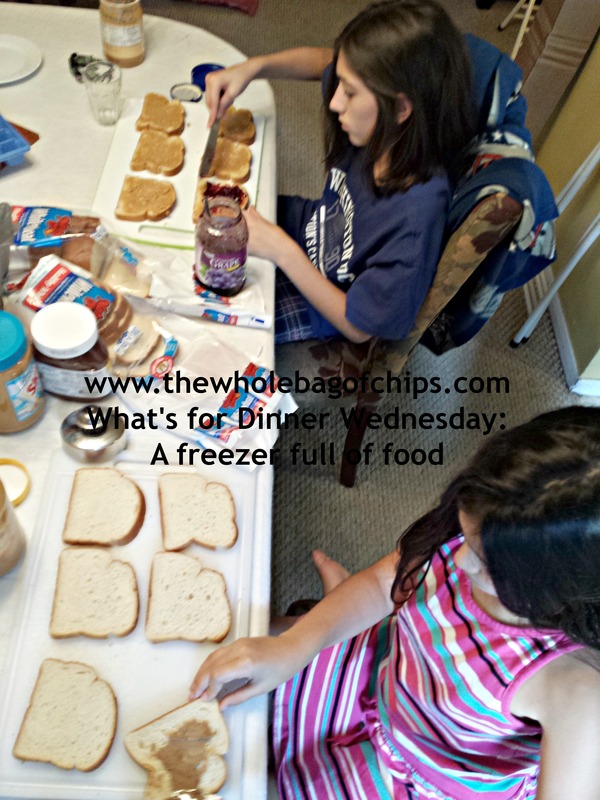 Her thought was that if Smuckers “Uncrustables” could work for lunches, couldn’t we use our Pampered Chef Press and Seal tool to make our own and freeze them? I tried it a couple of times last year and it worked out fine, but I really wanted to make up a whole big load of sandwiches. I had two loaves of bread waiting for me. The night before school, I got my supplies together: creamy peanut butter, crunchy peanut butter, strawberry jelly, grape jelly, Nutella and Trader Joe’s Crunchy Cookie Butter. I got a cutting board and a whole bunch of knives (no cross contamination!) and got to work. It took about one minute before my two kids who were nearby saw what I was doing and wanted to take over the project for me. Many hands make for light work! We got a lot done in half as much time. I got a second cutting board and they both got to work. In under an hour they’d done both loaves of bread, creating and sealing any kind of sandwich they personally liked or knew someone else liked, and I bagged them and labeled them. Done. I put three in the fridge for the next morning and gathered the rest. I was so excited. I went downstairs to my freezer and cleared a spot on the door for them. I looked into my freezer, so proud. We were ready to star off the school year right: a bit more organized and prepared than before. I can’t promise that I can maintain this through the busiest parts of the year, but I feel like if I prep it during the slower parts of the year, then I can be ready when those crazy times hit, which for us is just prior to the holidays and during the last two months of the school year. We’ll see how it goes. For now though, we are better off than we were! My general philosophy is “anything I do is better than doing nothing at all” and I do believe that. One step ahead is better than being three steps back. I hope everyone has a great fall, and a great school year!